NEBOSH is National Examination Board for Occupational Safety and Health, a UK-based educational board, which offers widely accepted safety and health courses through affiliated partners across the world. NEBOSH IGC is a globally recognised HSE qualification which improves the job prospects, This qualification is for those who wants embark in HSE fields and as well for those working professional who wants to enhance their career profile. Develops your skill and knowledge professionally in Health, Safety & Environment issues. Be more confident in qualifying, as we have higher pass rate than others. Green World Group's count of success in Numbers! Nebosh training offers students have Good understanding on international Safety standard, enabling them to become efficient HSE Professional. NEBOSH IGC is International recognized and improves job prospects, As90% of overseas Health and Safety Jobs requires nebosh Qualification. NEBOSH Certificate holder become eligible to apply for Associate Membership of IOSH (AIOSH), Technician Membership (TechIOSH)&Associate Membership of the IIRSM (AIIRSM). (Click here to Read More on) Who can do NEBOSH IGC Training in Chennai? 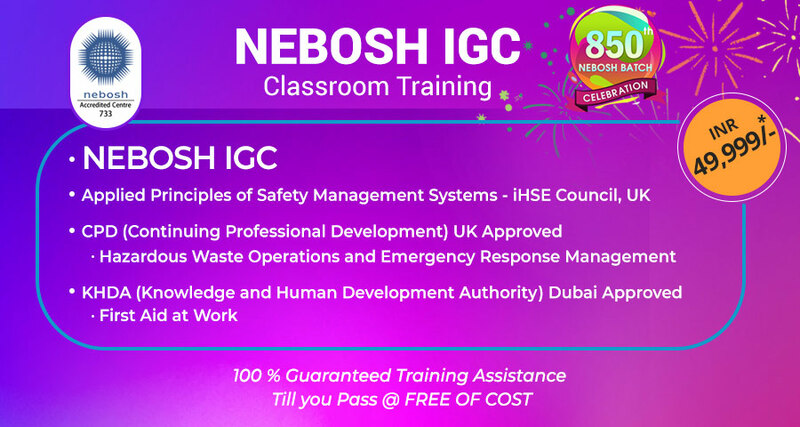 NEBOSH IGC is highly recommended for those who are already working and wanted to enhance their career as successful HSE professionals or Safety officers. Since the course is laid as per International Labour Organization (ILO) conventions and recommendations, it is internationally accepted, those who clear this course can get absorbed as safety officer or Safety Manager or related HSE posts in any industry, anywhere in the world. (Click here to Read More on) Why to take NEBOSH Course in Chennai with GWG Institute? Being the top most institution for NEBOSH training, students can benefit a lot once they associate with us for HSE training in Chennai. We are the recognized NEBOSH IGC trainer who has completed over 850 NEBOSH IGC batches through our worldwide branches. State-of-the art classroom training with interactive sessions to enable students get industry-ready knowledge and practical skills. Green World Group is one of the Best safety institute in Chennai & authorized NEBOSH accredited centers with branches at 11 major cities across India. Our State of the art sophisticated Class room is located at prime location in Chennai. Apart from providing Nebosh Training in Chennai, GWG also offers Safety courses & other international safety training to cater the needs of all industry. And accredited by Several UK Body such as NEBOSH, IOSH, RoSPA, IRCA, iHSEC & CPD. Great Minds of Tomorrrow from Green World Group! Just wanted to say thanks again for the excellent training session – it was really timely for me and has definitely helped me approach things slightly differently. I’ve certainly never had training quite like it but it was such a refreshing and relaxed approach and I can remember more from it than any other training I’ve ever done. 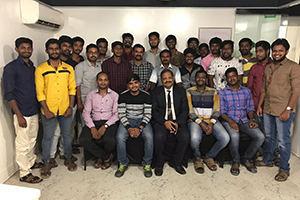 I Am NallaRajesham and I’m one of the students of Green World Group Chennai batch sep 5th to 15th studying in this institution is an excellent experience especially in equipping their students on health and safety grounds. Thank you is not enough to express my gratitude in achieving the NEBOSH IGC certificates, especially to all the staff of GWG who help me attain this certificate. Also to my Trainer ..who assisted me through out my studies. I would suggest to everyone that if you’re looking for a better future in HSE profession don’t hesitate to go to Green World Group. The materials provided by green world group is highly effective for the preparation for NEBOSH IGC. 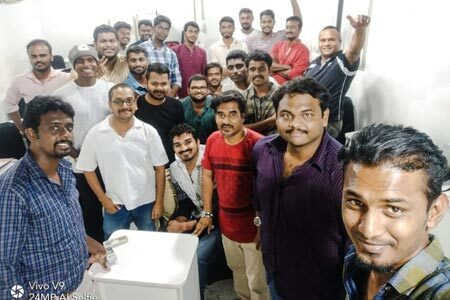 I am happy that i got trained by green world group because the hospitality provided by green world is very nice and any admin related issues are solved quicky and easily. Trainer ..have a sound knowledge and experience in safety field so training given by him is very effective and lectures delivered by him is very interesting which will not make to feel boared. Tips given by him is very useful for the preparation. I thank myself to green world group Management for providing our batch such a knowledgeable person. The fees paid for the course is worthable for the training and hospitality provided by green world group. I have done NEBOSH igc in CHENNAI under the guidance of our Tutor. 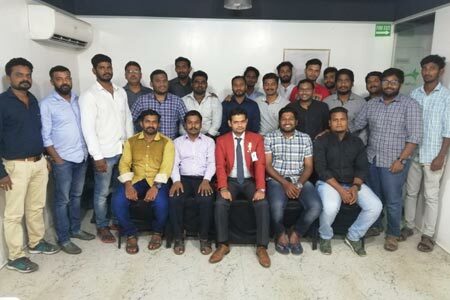 The training classes did make a big difference in the preparation of these exams as i learnt lot of additional information regarding safety and other industrial knowledge. Also each and every line is being clearly explained with more than sufficient examples. Videos regarding certain topics were also played for better understanding. I would highly recommend you to do your NEBOSH in green world group. My name is Murugesapandian and i had experience in Oil and gas industries field. I wanted to do Nebosh. That time I had came to know about Green World Group chennai. One of my friend and as a co-worker of my previous project. He was successfully passed NEBOSH IGC in green world training institute chennai. So he suggest me to go for green world institute chennai. So i wish to join the institute in chennai. Before attending the class i had a little confusion regarding the passing of examination but when i attended the first day of class i was surprised and amazing. The training and the teaching method was excellent throughout the course. The trainer ..had given his part in a superb manner. He guides us such a wonderful teaching with the practical manner and with an examples the way of easy learning and easily can be understood of the subject oriented as well as practical. We can easily understood many things from his teaching. I really wonderful for choosing Green world group institution. And i had a confident i will succeed the examinations. Once again i really thanks to my Trainer.. for easy understanding of Nebosh lessons which is going to helpful for throughout my carrier. The day I have travelled during my course was wonderful. It was nice experience at all. Greenworld group is providing fantastic platform to learn the topics for your upcoming Nebosh examination in very short span of time. The tutor/coach ..is having very unique way to teach you so that most of the things you can memorised in the classes only. Not only he is covering the topics of Nebosh but also give a feel of examination by solving the old questionnaires. Daily we are having mock test which gives you an overview of different type of questions can be asked in the Nebosh exam. Regarding the management they are organising the programme in a very good hotel having nice food and clean ambience which gives you an extra power to sit for 8-9 hours for the classes. Our coordinator is also taking care of all our needs for classes as well as examination. So, overall Greenworld is providing a complete package for Nebosh exam from class rooms to examination centre. Thanks a lot for the good care and best of luck for the upcoming classes and programmes. 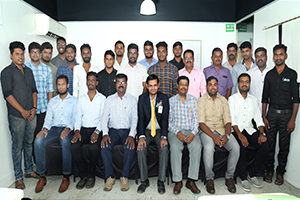 Green world group is the best place for NEBOSH IGC, I have joined GWG 2018 October batch, they trained me very well, they cleared all my query about NEBOSH IGC, And Our Tutor was excellent and very well behaved Tutor, His teaching method and the way he trained,motivated, encouraged, all was appericiatable, I would like to suggest other, To join GWG who is looking for NEBOSH IGC, And Their Administrator they r very good and well behavioured, they clear your all the query at the time of Admission. And the food facility is awesome. Thanks Green world.